The Bob Design-led Hostel is a unique design-led hostel that was built with an aim of taking care of all your needs plus accommodate many more of your needs without you even realising them. This hotel makes use of many vibrant colours that helps you see Bangkok in a different perspective. The rooms come with a beautiful view of the city of Bangkok. They are spacious and have comfortable beds. A few rooms come with a private bathroom while the dorm rooms have a shared bathroom. This hostel is a great way to meet likeminded people from around the world and also a great place to socialize in an unknown city. The Bob Design-led Hostel is generally not available on the guided Bangkok tours, but there are plenty others that are worth visiting. Use Bangkok trip planner to visit The Bob Design-led Hostel and many others to your visit. You won't miss your home when in Bangkok, hotels in Bangkok like Ibis Bangkok Riverside, Kokotel Bangkok Surawong, Holiday Inn Express Bangkok Sathorn and Marvin Suites offer some of the best places to stay in the city. How popular is The Bob Design-led Hostel? People normally club together Vivente Life & Coffee and The Platinum Fashion Mall while planning their visit to The Bob Design-led Hostel. This was a big let down. We booked 4 nights and we were dying to get out of there by the end of it. The place was filthy, there was mould all over the showers, clutter everywhere, a horrible stink that never went away and worst of all, we found a used cotton bud and a set of chopsticks at the end of our bed! It’s definitely the dirtiest place I have ever stayed in. The lockers were just big enough to plug your phone in to charge and leave a few valuables which was fine but the lock was broken on both of ours. There were no communal areas at all, other than the roof where there is a small table and chairs so if you’re looking to meet other travelers or for somewhere to relax I would go somewhere else. The location itself isn’t great if you want to see the sights but there is a 7/11 and plenty of nice restaurants around and it is fairly easy to hail a taxi. Overall I would say it is a cheap place to crash if you’re looking for a quiet night but there are plenty of other hostels around Bangkok that will be cleaner and more comfortable for you. Do not hesitate! If you wanna have a good time, meet nice people, it's the good place to go to! We spent 2 nights there and the host were really nice to us and helpful. The shared room we had was simple but we slept well, there's the AC too and it's clean. There's a beautiful rooftop lighted in the night that makes it really nice, we spent a good time on with the others roommates. Around the hostel you have everything you need to eat, to go out, to cut your hair... There's not a lot of foreigners so it make you really feel in Thailand! Well, you can go there! Fantastic hostel! I dont understand what people are complaining about, very clean beds, clean shower and also warm water, just wait, and really dont understand why people are so sensitive and complaining when is there no reason, nice stuff also. I was in many hostels all over Asia, and BOB is just perfect for the price, so if you looking for fancy stuff - stay home. Also nice rooftop view. Thank you. If you want clean, affordable hostel with privacy, this place is great. To add to that, you can do laundry for only 30 baht. 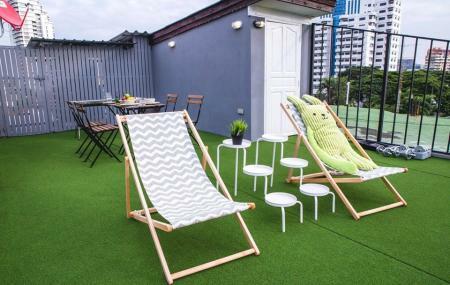 The rooftop is where you can chill and relax after a long busy day.